Microsoft has rolled out the latest update of Dynamics 365 - version 9.0, which provides a number of new features and upgrades. If you want to see what version 9.0 has to offer, you can sign up for a 30-day free trial with C2. We decided to cherry pick some of the best features for this blog. The new Unified User Interface (UUI) was designed to enhance the consistency and accessibility of Dynamics 365 features to better adapt to screens across web, Outlook, mobile and tablet devices. UUI enhances the consistency and accessibility of Dynamics 365, bringing an end to design conflicts and introduces new design principles of the UUI (text wrapping, uniformity, styling, white space reduction) that sees content presented in a way that flows into different positions as the available space changes throughout the interactions. An important component within the rollout of the Unified User Interface is the new activity timeline control that has revamped the Social Pane. The timeline control now has Notes, Activities and Posts combined into one feed which is presented in chronological order. You can also view attachments and assign tasks in line with the activity timeline feature. Another interesting update that we believe would increase productivity is the “What you have missed” section. This allows you to see what has been created since the last time you accessed that particular record. You can also configure what activity type to show in the Timeline on a form-by-form basis. This is only available in the Unified User Interface and not the Web Client. The combined single view of Activities , Notes and Posts is also available on both Mobile and browser client. 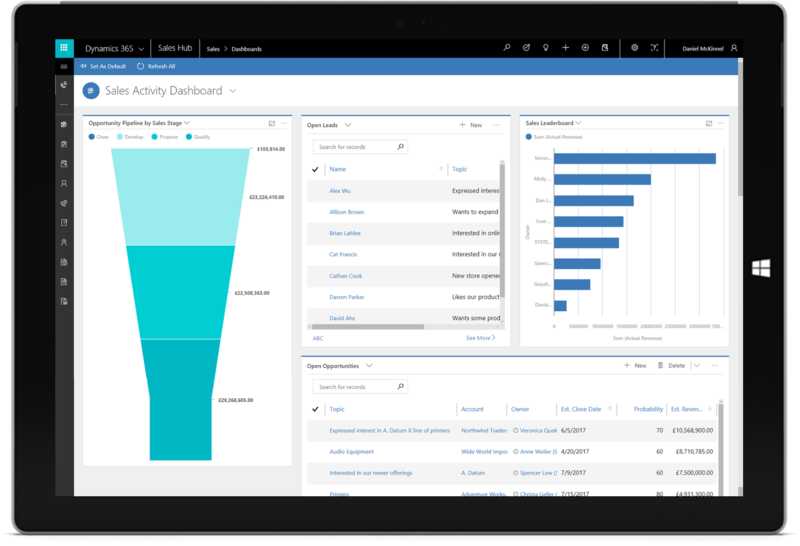 The new Dynamics 365 Sales Hub enables sales reps to build strong relationships with their customers, take actions based on insights, and close sales faster while they’re on the go. The Sales Hub better prepares sales staff to keep track of accounts and contacts, nurture sales from lead to order, create sales collateral, create marketing lists and campaigns, and even follow service cases associated with specific account or opportunity. The Sales Hub app is built on the Unified Interface framework, which uses responsive web design principles to provide an interacting experience for any screen size, device, or orientation. The Customer Service Hub (CSH) has replaced the Interactive Service Hub (ISH) in the aim to provide an optimised user experience for service teams to manage cases and knowledge based posts more proactively. CSH is built on the new Unified User Interface and will be accessible on mobile devices. Its performance promises to be significantly improved compared to the ISH which will enable new interactive dashboards to be created with ease which offers a sharper look and a more user friendly interface than the ISH. These are just a few snap shot features that was released in July 2017 for Dynamics 365 Version 9.0. To discover more on what is being made available and what is in development for Dynamics 365 Version 9.0 you can visit the Microsoft Dynamics 365 Roadmap, alternatively you can Contact Us today to discuss how Dynamics 365 can transform your business.